Learn how to properly assign a system name to your page. Within a given folder, each component must have a unique system name. You can (and will) have duplicate system names in different folders. Each folder must have a page named index - this is the default page that will show up when a user navigates to that folder. When you create a new page or folder, enter the system name in the first field ("Page Name" or "Folder Name"). It will default to the name of the template. Override this with the name of the page. If it's the primary page in a folder, use "index" for the name. If it is any other page or folder, name it something meaningful and short. 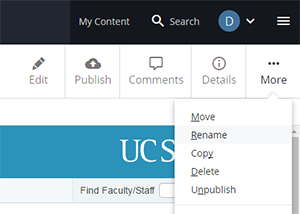 Files and images you upload to the CMS should also follow the same rules for system names. The system names for files must include an extension (e.g., .pdf, .jpg). Changing a system name will change the URL (web address) of a page. This will break links to the page (including bookmarks). Do not change a system name without discussing it with the site manager first. Note: Make sure that "Unpublish Content" is checked. This will make the CMS automatically unpublish the page for you so it doesn't live on the server under it's old name forever. The file will now be renamed in the CMS. The page will be unpublished from the live site. To have the newly remained content appear on the live site, you mush publish it.